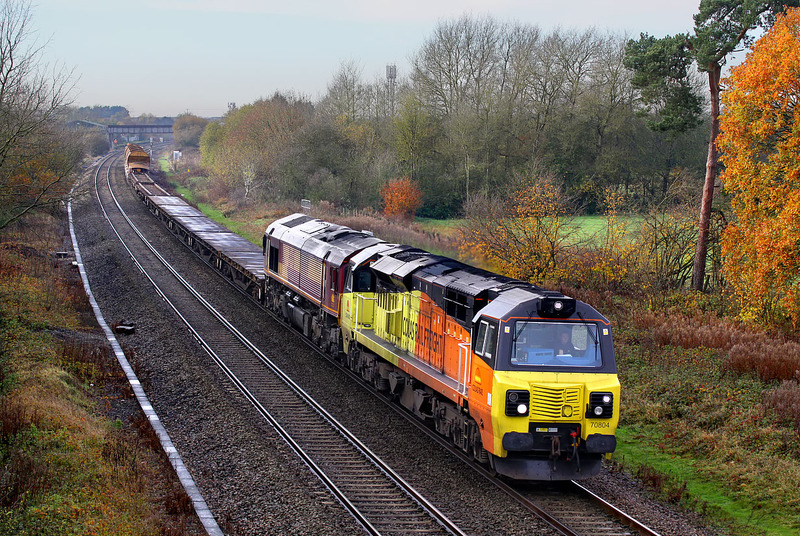 70804 has 66169 in tow, as it approaches the site of Ashbury Crossing, near Shrivenham on 24 November 2014 with the 6M50 11:00 Westbury to Bescot engineers train, retimed from its usual 07:55 departure. Soon after leaving home the sun completely disappeared, despite the forecast, so I opted for Shrivenham instead of Uffington, which had been my original choice. As it was dull, at least there were no shadows from the trees on the left of the picture, so I suppose it was a lucky last minute decision. Also, the last of the autumn leaves on the right add colour to the picture.